Think back to the first surf photo that you stared at and thought, I want to take a photo like that. That’s what myInspiring Top 5’s posts are about, finding the photographs that make you want to get out there and create your own. I will add some more top 5 lists in different categories, but perhaps the most obvious source for a quick photo fix is Instagram. There are plenty of great feeds to follow to see the latest and greatest surf images, but I have chosen these 5 because they offer something more to me as someone starting to learn surf photography. 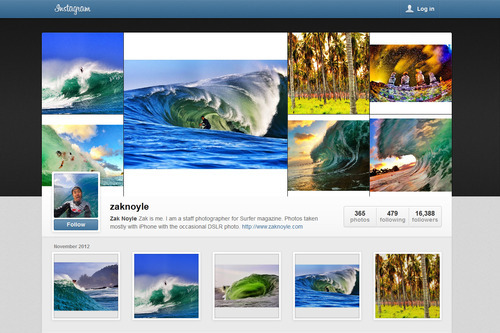 Zak Noyle takes awesome photo’s, some taken with an i-phone in a housing which are verging on gimmicky but plenty of quality shots from a DSLR water set-up, it’s particularly interesting for budding surf photographers because he includes the camera and lens combo he shot it with in the caption, you will want to buy a 70-200 lens after browsing it for a few minutes though. 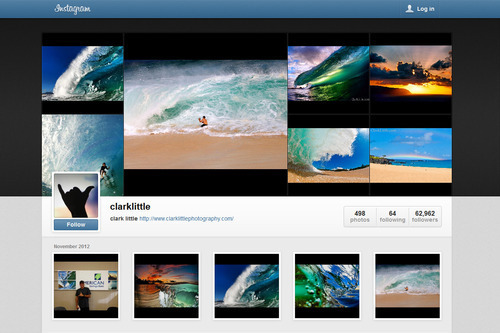 If you’re interested in fisheye photography in the water you will have seen Clark Little’s shorebreak pictures, his Instagram feed is regularly updated and you can dig through the comments on the most popular photo’s and find some interesting facts about his set-up and how he shoots. 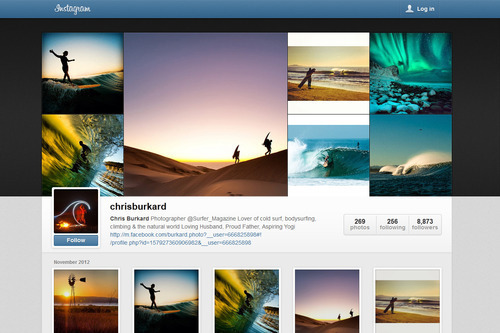 There’s not much technical info to be gathered from Chris Burkard’s Instagram feed, if kit is mentioned it’s brief and vague, but I think it’s because the majority of the shots are selected for their atmospheric quality rather than the technical surfing or photography that goes into capturing the image. I often look at some of his perfectly composed line-up shots and think, I could have shot that, if I’d thought of it – the technique or gear being used is very much secondary, truly inspiring for the trainee surf photographer. 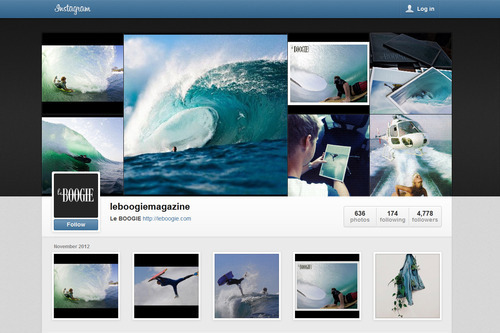 Le Boogie is a bodyboarding magazine that differs from every other magazine by focusing a lot on photography, the best way to describe it is to imagine a “photo gallery” feature in any other surf magazine: several double page spreads, uninterrupted by adverts, then imagine every issue has three of these as well as interviews and features featuring full pages of text accompanied by full page photo’s. It’s instantly clear that quality photography comes first. 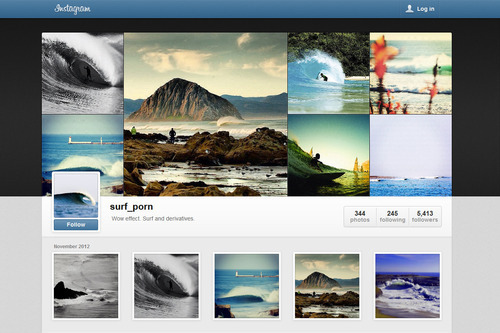 I include their Instagram feed as one of the top 5 for aspiring surf photographers mostly because of the daily “full bleed” image, always an amazing photo and always credited with the photographers Instagram handle, tap the photographers name and you can browse their feed. The Le Boogie feed has been responsible for me following more people than any other corner of Instagram. I’m almost reluctant to put this one in, whoever curates this feed has a pretty relaxed attitude to attribution, the photo’s are rarely credited which is frustrating for someone like me who wants to know more about the images and I can’t help wondering if the photographers would be exasperated to see their pictures randomly pop up out of context on an anonymous Instagram account. But sometimes you just want some eye candy for inspiration, and this does deliver that, I reconcile the lack of credit by assuring myself the images have at some point been made available on line by the photographer and that the 5400 followers might not otherwise of seen them, I’m sure that’s what the person behind the feed thinks and it does allow a lot of impressive surf photo’s to be collected in one place which would not be possible if the correct permissions were required. Not a necessary evil, but a convenient one for anyone learning surf photography. I’ll be back with another inspiring top 5, some video content, and more, fairly soon.